Since the mid-1980s, the death rate from breast cancer among Canadian women has decreased in each age group because of life-saving breast screening programs, increased breast awareness, as well as improved treatment options. Although we know more now than ever before about breast cancer, we have yet to fully understand what causes the disease. Because of this, breast screening and education still remain our most effective tools for prevention and early detection. According to Canadian Cancer Statistics 2015, breast cancer is still the most common form of cancer among Canadian women and the second leading cause of cancer death in women, behind lung cancer. The Ontario Breast Screening Program (OBSP) outlines when women should start the screening process based on their personal and family health history. 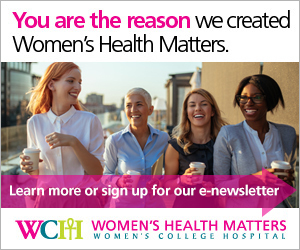 “According to the guidelines from the OBSP, routine screening mammography should start at age 50 for women at average risk of breast cancer and women should continue to be checked every two years,” says Dr. Sandy Messner, physician at the Henrietta Banting Breast Centre at Women’s College Hospital. Confirmation of a BRCA1 or BRCA2 genetic mutation after completing genetic testing. Women who have a parent, sibling or child with the genetic mutation, even if they have not completed genetic testing themselves. Women with a family history of hereditary breast cancer, with greater than or equal to a 25 per cent lifetime risk of breast cancer. This is confirmed through genetic counselling and formal risk assessment. Women who received high dose radiation to the chest wall before age 30 and at least 8 years prior (i.e. for Hodgkin’s Lymphoma). It is important to be aware of the downsides of screening. This includes false positive findings, i.e being called back for further work up of things which turn out not to be cancer, and overdiagnosis, i.e. finding a cancer that a woman would not otherwise have known about in her lifetime. Both can generate tremendous worry for women. Despite its drawbacks, mammography remains the gold standard for the early detection of breast cancer and the only screening test shown to reduce the number of breast cancer deaths. While mammography and MRI screening has greatly improved early detection for breast cancer, Dr. Messner notes that even with the OBSP’s guidelines, it doesn’t mean women should wait until they’re 50 to start paying attention to their breasts. “What we promote is breast awareness. We want all women to know what their breasts look like, what they feel like and how they change over time. The OBSP’s guidelines are there so that people know when they should start considering regular screening, but breast awareness should be a lifelong process for women,” adds Dr. Messner. “Maintaining a healthy and balanced lifestyle is really the key to lowering your risks for any chronic disease,” says Dr. Messner. Keeping an open relationship with your doctor and committing to regular checkups is another way to keep informed of your body’s changes throughout adulthood. “If you are not yet old enough to be having regular screening mammograms, you should still see your primary health care provider for discussion of imaging if you feel something is happening with your breasts. If you're over 30, you are not too young to have a mammogram if you have a breast concern,” adds Dr. Messner.